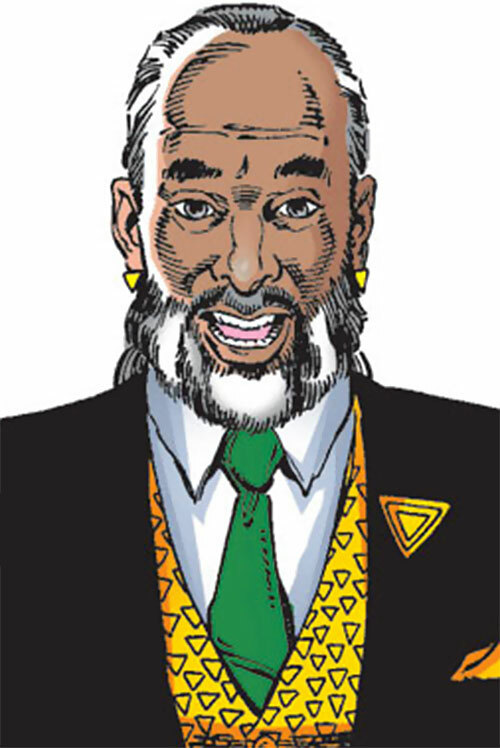 J. Tremont was the central character of an extensive Avengers story arc. 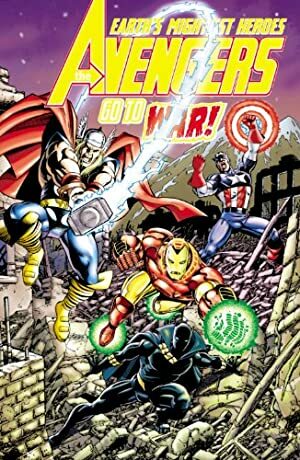 It unfolded over 2+ years during the 1998 run on avengers, written by Kurt Busiek. It was a tale of cosmic evil, modern mega-cults evoking both Scientology and 1960s Indian gurus, super-opponents able to fight the Avengers on their own, 1950s Timely Comics campy characters and other good stuff. With Pérez art. Known Relatives: Unnamed brothers (Pagan and Lord Templar, deceased). Group Affiliation: Leader of the Triune Understanding. Height: 6’3” Weight: 267 lbs. 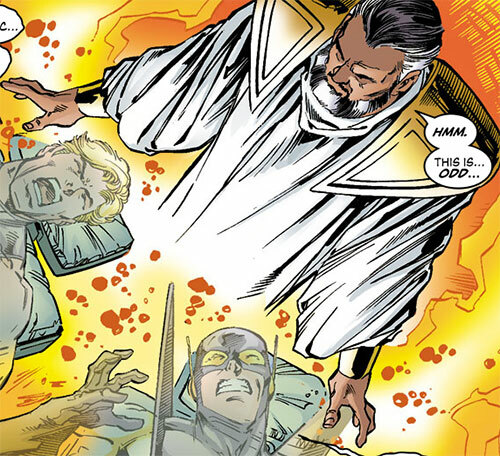 Empowered by the shard of purifying light, Tremont is able to feed on the beliefs of his followers, constantly drawing on an unnoticed amount of their faith. If necessary, he can increase this, draining all their faith, to the point of leaving them burnt-out husks. He rarely uses it in spectacular displays, since that doesn’t project the image he wants, but floating in a meditative state, or using his powers for long distance communication, are things he’s been seen doing in private or among trusted followers. He can also manifest the spirits of his dead brothers as Pagan and Lord Templar, sending them out in the world to do his will. 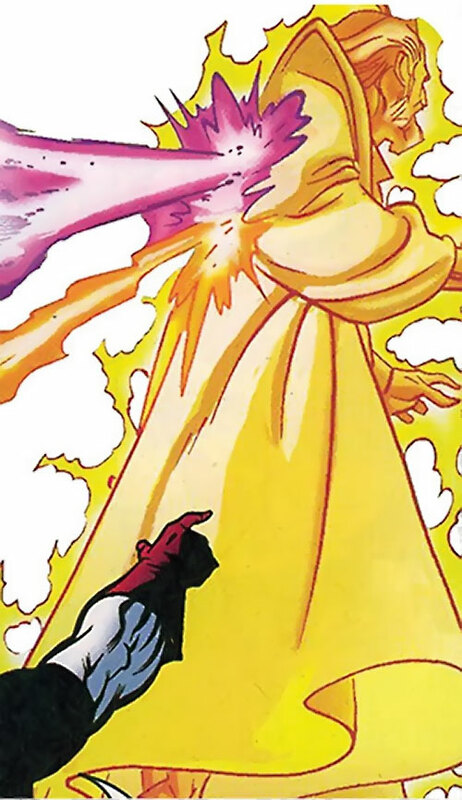 When he needs serious power, he draws on the (usually willingly donated) faith of his followers, and can wield far more power, projecting blasts of energy, growing to at least forty foot, and flying in space. He’s also a highly charismatic individual, skilled at working the media. Thus, at its height the Triune Understanding had sympathizers all over the place. Born in the Naga Hills of India , the boy who would become Jonathan Tremont was the youngest of three brothers. One was wise, one was strong, and Jonathan was charming. When sickness attacked the village, it claimed his brothers’ lives, but he somehow managed to hold onto their spirits. As an adult he acted as a guide when the American Hal Chandler, the retired 3-D Man, was drawn to the area. Chandler found the shard of purifying light which had drawn him there, a mirror to the one which had empowered him. But Tremont struck him down from behind, claiming its power for his own. It allowed him to return his brothers to life as Pagan and Lord Templar. And it also revealed to him its own origins. Early in the universe’s life, three beings of power, the Trion, created a sphere. They expelled their evil impulses into that sphere, imprisoning them forever. But a shard of it escaped, tearing through a rift in reality to another realm. The universe reacted to its presence, forming a defence against this evil in the form of three shard of light. One was used by a hero who tried defeating the evil alone, but he fell within the vessel. The other two shards landed on Earth. One empowered Chandler, and the other was lost in the Naga Hills. Foreseeing the arrival of the vessel, Tremont dedicated himself to preparing to vanquish it. The submission of the planet to his rule would be his reward. He set up a self-help group which eventually evolved into the Triune Understanding movement. He used Chandler, whose body he had kept, to empower Triathlon. From there his link to the Triune Understanding brought more members, increasing Tremont’s power. Needing to get more worshippers fast as he sensed the time growing close, Tremont manipulated events to turn people from conventional authorities. He had Lord Templar fight the Avengers, claiming to have allies in all governments. News of the claims spread, despite denials. This created a sense of suspicion, especially when Templar appeared at the residences of various heads of state. He also initiated a smear campaign to discredit the Avengers, and to set them up as bullies opposed to the Understanding. When the Avengers tracked Lord Templar’s energy trail to the Triune Understanding’s Texas facility, Tremont had Pagan attack the Avengers. 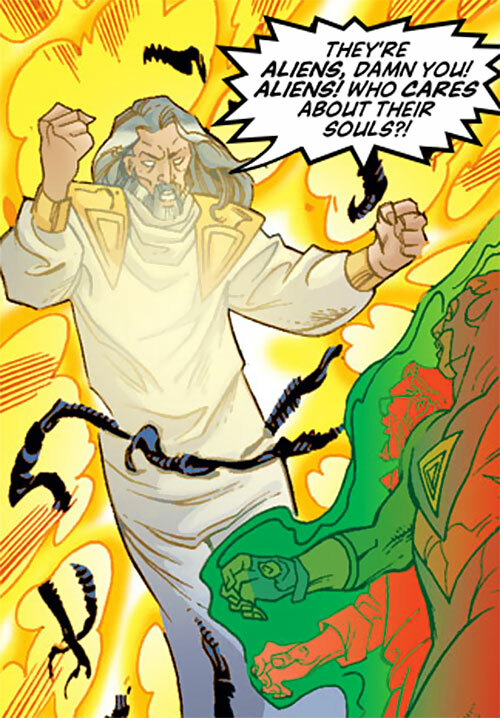 Then Lord Templar arrived to subdue him, making the Avengers look bad. He then arranged for some reserve Avengers to be tricked by Taskmaster, impersonating Captain America (Steve Rogers), into damaging a Triune Understanding facility in New York. Publicly forgiving the Avengers, he manipulated them into accepting Triathlon onto the team. That was despite the Avengers’ distrust of the organisation in general and Tremont in particular. 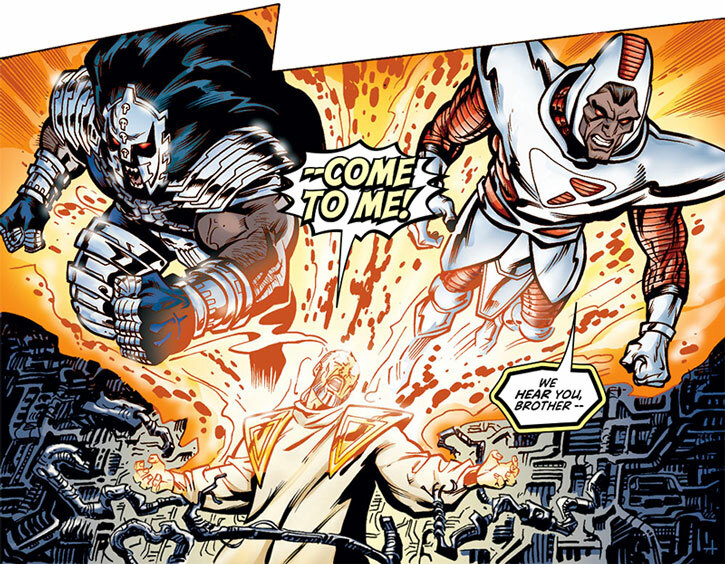 He then had Lord Templar and Pagan, working together after Lord Templar allegedly tamed Pagan, attack the Avengers. This way, Triathlon could be instrumental in taking the pair down. Tremont turned a blind eye when the Avengers had Justice and Firestar infiltrate his organisation in disguise. That remained true even when they discovered the spacecraft he had his people excavating beneath their New York facility. He also helped the Avengers when Hank Pym had been split into two beings. Tremont used his mental powers to facilitate Pym’s reunion. Sensing the Triple-Evil arriving in the solar system, he allowed some Avengers to accompany him in meeting it. At that point, most of the team were occupied with Kang’s invasion. Arriving on board the vessel, the Avengers were initially held within dream prisons, until Captain America managed to overcome his and break them free. When the evil showed its true face, Tremont freed Pagan and Lord Templar to aid in the fight. Then he drew on the spiritual energy of his followers to empower himself. He quickly became drunk on the power, draining the followers with him of their life forces. Tremont even killed his brothers to enable himself to face the Triple-Evil. When he tried draining Triathlon, however, he ran into problems. Triathlon found the remains of the hero who’d carried the other shard, and used the two to pull Tremont’s out of him. Triathlon then defeated the Triple-Evil in his place, and Tremont was taken captive. Realising they’d spent longer in the vessel than they’d thought, the Avengers learned Kang had conquered Earth in the meanwhile. They used the Triple-Evil vessel to attack Kang’s Damocles Base spacecraft. But Triathlon pointed out the Triple-Evil vessel was powered by the souls of its victims. Enraged by their unwillingness to do whatever it took, Tremont called on the last of his power to break free and attack Damocles Base. He broke its force field before being killed by its defences. Playing the role of a benevolent and caring pacifist, Tremont can be charming and charismatic. But he’s actually manipulative and power-hungry. Tremont is willing to sacrifice anyone and anything to achieve his ultimate goal of world peace under his rule. Power Reserve Must Be Fuelled By Spiritual Drain (-75BC, -5FC), and powers Energy Blast, Flight, Growth, Omni-Power and Sealed Systems (+15BC). Spiritual Drain RAPs Add to Power Reserve (+3), and can only target followers of the Triune Understanding and his brothers (-1). Telepathy is Minor Marginal when used on non-believers (-1). Credentials (Triune Understanding, High), Expertise (Media), Omni-Connections. The above are for Tremont at the height of the Triune Understanding’s power, during the campaign he and his brothers enacted against the Avengers. Prior to this his Credentials weren’t that powerful, and he didn’t have Omni-Connection. He lost his Connection to Triathlon shortly before his death. Source of Character: Marvel Comics (Avengers vol. 3, various issues between #13-53).